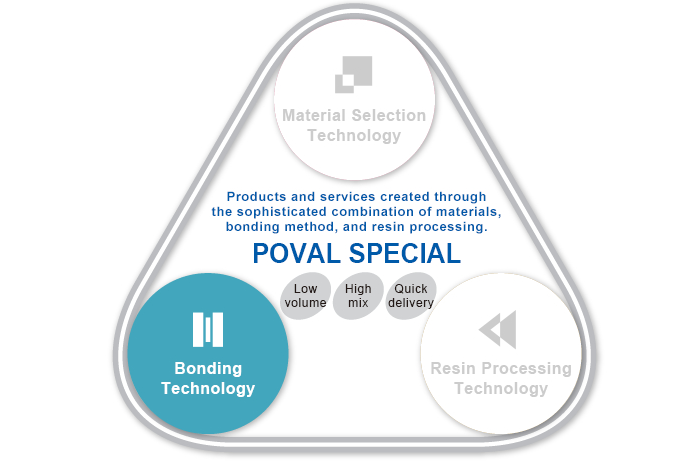 Bonding Technology｜Main Technologies｜Our Technology｜POVAL KOGYO CO., LTD.
We achieve bonds of greater quality by maintaining the inherent features of a material and combining it with a different material that can compensate for the first material’s weak points. Taking into consideration things such as a product’s application and use environment, we make the bond difficult to come apart even under unfavorable conditions such as high temperatures and chemical washing, without hardening. We can also make the bond easy to come apart, such as when recycling or disposal are intended. We choose adhesives that bring out the best performance. We select appropriate coating methods. We dry the area where adhesive is applied to create the bond. We employ technology to bond various polymeric materials together in the ideal conditions. We use heat and presses to compression bonding of joined materials. We achieve the best, stable bond performance by hardening the compression-bonded materials without applying a load (a force that could detach the bond). We conduct adhesive application, drying, and compression bonding in succession.